Back in April, InformationWeek conducted a survey of business technology professionals about their unified communications (UC) plans. Researchers found that despite all the hype surrounding UC, adoption remains slow. * 39 percent of respondents said they have no plans to deploy UC. * 30 percent have UC in place. * 34 of the respondents said they had no plans to deploy UC. * 12 percent had UC in place. 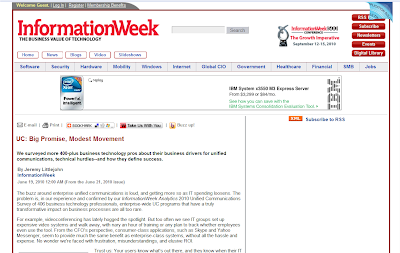 I was reading over Jeremy Littlejohn's analysis of the findings recently in InformationWeek. He presents some great insight into why companies are facing challenges with UC systems, and I encourage you to click over to read it in more detail. One of his points that struck me was, "... enterprise-wide UC programs that have a truly transformative impact on business processes are all too rare." I agree. And I think it's because many executives have misguided notions of what it is, what it can and should accomplish, and who should be driving it. My solution? I wrote about it in the comment I left on the article. So after you read Jeremy's analysis, be sure to scroll down to the bottom and get my feedback as well. What are your thoughts on UC? Do you think InformationWeek's survey is reflective of your own experience?